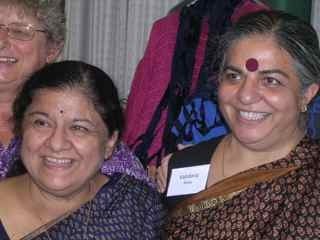 "My sister and I will be with the Sisters of Earth, the radical nuns, in New York in July," Vandana Shiva told me, before she and I hung up the phone, just after recording our Living Hero interview this past winter. Radical nuns, hmm, I was intrigued and also excited about the prospect of meeting Vandana in person and spending a few days with her and Mira Shiva. A short time later, I was a newly minted member of the Sisters of Earth and was signed up to attend the 9th biennial Sisters of Earth conference on a press pass. The conference was held at The Passionist Retreat Center in Riverdale, New York, along the East bank of the Hudson River. Listen, if you've never been in a room with 160 powerful, educated, purposeful, spiritually mature, and actively engaged women, you have missed the effect of an incomparable force-field. Not your average crowd! This special report on the Sisters of Earth conference will give a hint at the depth and breadth of conversation and ceremony, and hopefully, too, a taste of the uplifting energy and heartfelt concern we experienced as a group. This vital network of women religious and lay women is working to foster widespread adoption of eco-spiritual values in the United States and around the world. Click on The Power of Wisdom under Recent Posts on the sidebar to get to a Comments box and Submit button. Let us know your thoughts!